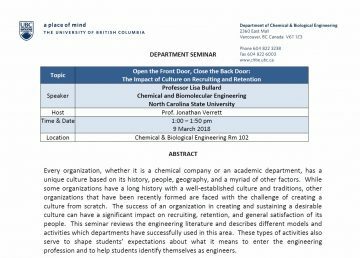 Speaker: Professor Lisa Bullard, Chemical and Biomolecular Engineering, North Carolina State University Date/Time: March 9th, 1:00 – 1:50 pm Location: Chemical and Biological Engineering, Room 102 Title: Open the Front Door, Close the Back Door: The Impact of Culture on Recruiting and Retention Please see below for more info. 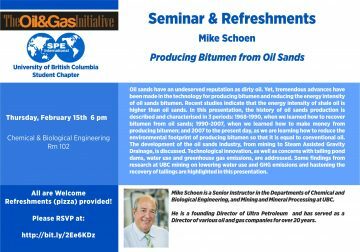 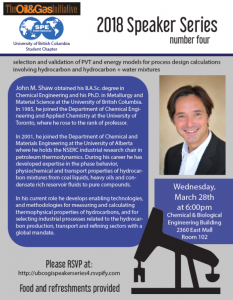 Speaker: Professor Mike Schoen, Senior Instructor in the Departments of Chemical and Biological Engineering, and Mining and Mineral Processing at UBC Date/Time: Thursday, February 15th at 6pm Location: Chemical & Biological Engineering Room 102 Title: Producing Bitumen from Oil Sands Please RSVP at: http://bit.ly/2Ee6KDz Please see images below for more info. 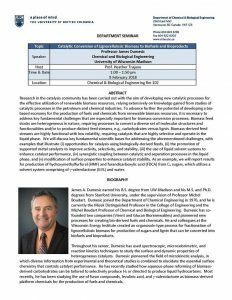 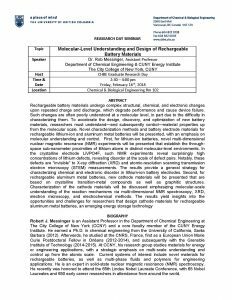 Speaker: Professor James Dumesic, Chemical and Biological Engineering, University of Wisconsin-Madison Date/Time: February 9th, 2018 from 1:00 – 1:50pm Location: Chemical and Biological Engineering Room 102 Title: Catalytic Conversion of Lignocellulosic Biomass to Biofuels and Bioproducts Please see images below for more info. 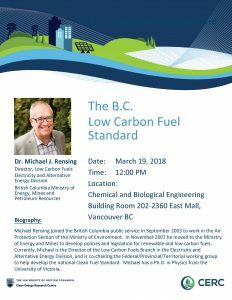 January 23, 2018 – Dr. Ian Frigaard: Why do Wells Leak and Who Cares?